Who we are. What we do differently. Right from the start, you’ll see the Han-Tek difference. We’re listeners first, eager to better understand your toughest materials handling or machine control challenge. Only then do we put our best minds together—along with those of our strategic partners—to develop a truly custom-engineered automated solution. Whether you’re upgrading an existing facility or building fresh, we’ll deliver results that go beyond expectations. From design, fabrication, installation, training, and service, Han-Tek is a turnkey provider, with you all the way. So whether your automation needs are in conveying; handling; loading or unloading; palletizing or depalletizing; or front-, middle-, or end-of-line integration, make your first call to Han-Tek. You’ll see the difference. With more than 50 years in the business, we know that it takes more than an “off-the-shelf” solution to do the job right. And most cost effectively. Han-Tek, an ISO 9001:2015 registered company, specializes in overhead cranes, robotics, integrated conveyors, AGVs, systems automation, and machine controls. 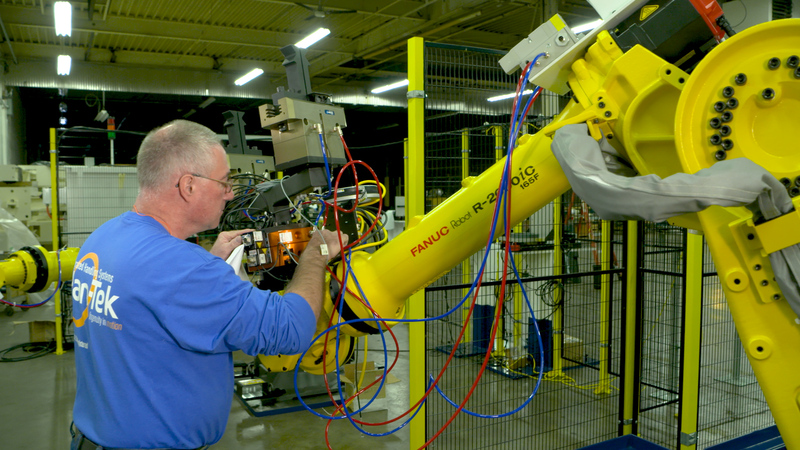 Let us show you how customized automation technology can maximize your productivity. And profitability. Contact our Solutions Group at info@han-tek.com or call us at 800.836.0237. Or review our case histories for fresh ideas to address pressing issues.